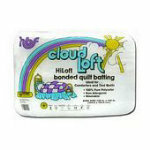 Notions > Batting, Interfacing, Pillow Forms, Fiber Fill > Cloud Loft King 120"x120"
High loft, resin bonded polyester. Approximate loft: 58" to 1". Nonallergenic. Washable. Can be quilted by hand or machine up to 46 apart. King size 120"x120".